Only 60w for 7700 lumens! 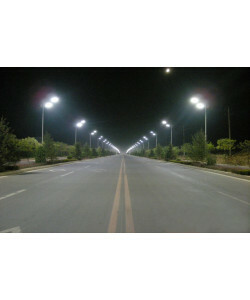 LED Street Lights are as bright as a 250w HID or hps light. 100-277 VAC. Good for poles up to 16 feet tall. 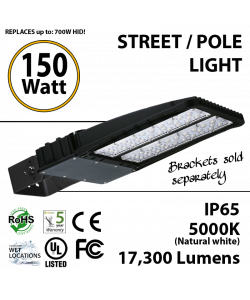 Replace your 350w HID or hps pole light with this 75w LED Street Light Fixture. 10000 lumens to spare. Let this be the last time you change the light. 120V. Exterior lighting is now a breeze with our new 480V, 75 watt, 10100 lumens LED Street Light fixture. Get rid of those old 350w HID light bulbs. 4000K. 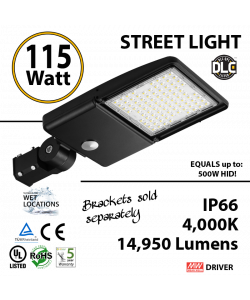 With a consumption of only 75w this 10300 lumens LED Street Light is as bright as a 350w HID or hps light. Stop replacing lights every year switch to LED 480V. Reduce your electric cost. Replace your old 350w HID lamp with these LED Street Light fixtures. 5700K. 480v. Those old tennis court's 350w HID lights can now be replaced with only 75w LED Street Light. One fixture. 10600 lumens. No more bulbs. 5000K. 120V. 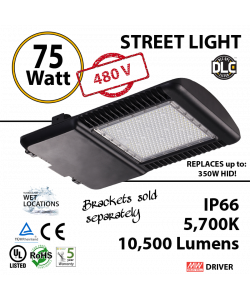 This 75w LED Street Light is the perfect replacement for any 350W HID lamp. 10800 lumens will light up the darkest parking lot. 120V. Save money now. Only 75w for 10300 lumens. These LED Street Lights are as bright as a 350w HID or hps light. 120V. Your roads will be brighter. Equivalent to a 350w HID or HPS lamp, this 480V outdoor LED Street Light will last for more than 15 years, and reduce your electric bill. 3000K. Only 100w for 11000 lumens! 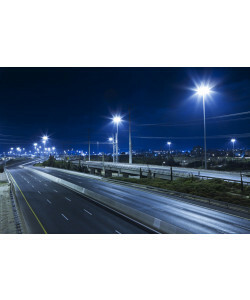 LED Street Lights are as bright as a 250w HID or hps light. 120V. Your parking lot will be safer and are inexpensive. Only 100w for 13600 lumens! 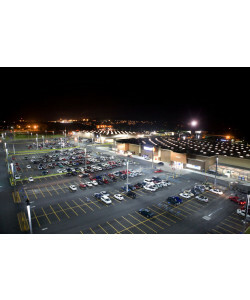 LED Street Lights are as bright as a 400w HID or hps light. 100-277VACV. Your parking lots will be safer and your roads will be brighter. Exterior lighting is now a breeze with our new 480V, 110w, 14200 lumens LED Street Light once you replace your old 500w HID light bulbs. No more maintenance. 3000K. Replace your 500w HID or hps pole light with this 110w LED Street Light. 14200 lumens to spare. Let this be the last time you change the light. 120V. This 110w LED Street Light Cobra parking light is the perfect replacement for any 500w HID lamp. 14700 lumens will light up the darkest parking lot. 120V. Save money now. Only 110w for 15000 lumens! These LED Street Lights are as bright as a 500w HID or hps light. 120V. Your roads will be brighter. Clear lighting for your sport fields? Only 110w will bring 15100 lumens of clarity and peace of mind. 120V. As bright as a 500w HID or hps light. Switch to LED. Clear lighting for your streets. 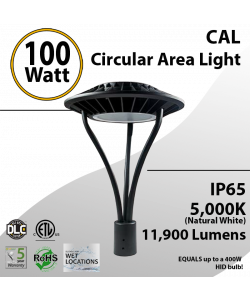 With only 115 Watts of power this street light fixture delivers 14,950 lumens of clarity and peace of mind. Operates from 90-305 VAC. Equals up to a 500W HID or hps light. Switch to LED. Only 150w for 17300 lumens! LED Street Lights are as bright as a 650w HID or hps light. 120V. Your roads will be brighter. 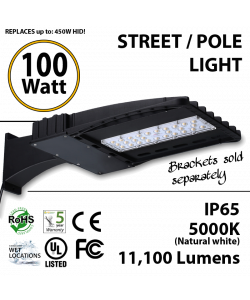 Replace your 700w HID or hps pole light with this 150w LED Street Light. 16500 lumens to spare. Let this be the last time you change the light. 120V. 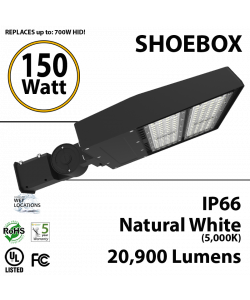 Exterior lighting is now a breeze with our new 480V, 150 watt, 17000 lumens LED Street Light. Replace your old 700w HID light bulbs. No more maintenance. 3000K. Those old tennis court's 700w HID lights can now be replaced with only 150w LED Street Light. One fixture. 17100 lumens. No more bulbs. 4000K. 120V. This 150w LED Street Light is the perfect replacement for any 700W HID lamp. 17700 lumens will light up the darkest parking lot. 120V. Save money now. Equivalent to a 700 watt HID or HPS lamp, this 480V outdoor street pole fixture will shine for more than 15 years. It will also reduce your electric bill. 4000K. Only 150w for 18000 lumens! These LED Street Lights are as bright as a 700w HID or hps light. 120V. Your roads will be brighter. 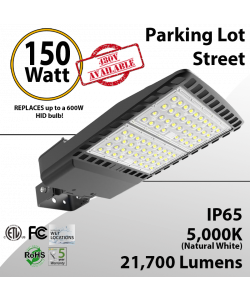 Streets need these industrial 150w LED Street Light fixtures that provide 18600 lumens to replace the old 700w HID or hps lights. 5000K. switch to LED now. 480v. 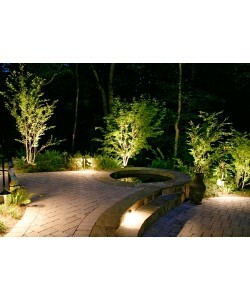 Reduce the electric cost of your commercial open space. Replace your old 700 watt HID lamp with these one of a kind LED Street Light fixtures. 5700K. 480v. 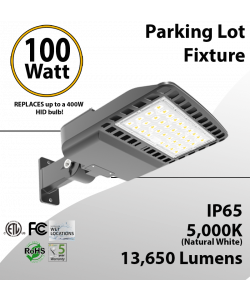 With a consumption of only 180w this 24300 lumens LED Street Light is as bright as a 800w HID or hps light. Stop replacing lights every year switch to LED 480V. 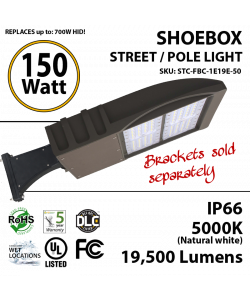 Streets need these industrial 180w LED Street Light ilumination fixtures that provide 25000 lumens. Replace your old 800w HID or hps lights. 4000K. switch to LED now. 480v.